Carpooling–going strong overseas–may be finally rev up here thanks to the domestic launch of Europe’s incredibly successful ridesharing program. Carpooling–which has has never really taken off in the U.S.–is about to get a little help from a European invasion. Carpooling.com, launched as an MBA class project in Germany six years ago, is now a continent-wide phenomenon that has cracked what it takes to get millions of people to open their doors to relative strangers: safety, convenience, and a little cash. “The key to the success of our site compared to others is that we want to give [people] options to [carpool] the way they like to,” says Odile Beniflah, a senior product manager with Carpooling.com. “In the last 12 months, it has really become a global phenomenon. Every single country we have launched in, it’s working.” So far, their formula has spread to 5,000 cities and 45 countries. Carpooling.com is relatively simple. Riders and drivers can search for each other on an online exchange. Members, whose identification is verified by the company, rate each other. Prices are suggested, but final terms are decided between passengers and drivers. Carpooling.com charges for premium features, and takes a cut from each fare. The service is now gaining popularity in European countries that never had a carpooling culture or, in the case of Italy, never even had a word for it. German airlines are teaming up with the site to give passengers a link to their final destination. Although carpooling in some places is just another form of public transport, the demographics still skew younger. 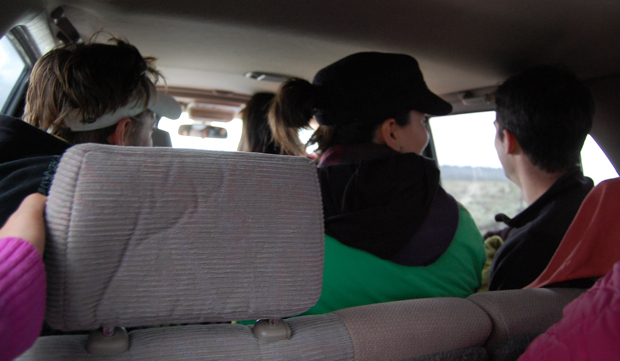 The average Carpooling.com member is under 35, and students make up a large, if shrinking, percentage of the total number. The primary motivation is money: More than 75% of people carpool for economic reasons, says the company and most trips seem to be intra-city with the average trip covering about 125 miles. dropped by half since 1980 as fuel costs fell dramatically and offices spread out into the suburbs, according to The New York Times. In 1980, the cost of a 30-mile round trip was $6.11 adjusted for inflation; today that same trip is just $3.12. It is possible the recession, and rising oil prices, will push more Americans to share rides to work each day. There will likely be plenty of carpool competition to put them there. UPDATE: There’s at least one promising carpool startup here in the US, so far focused on the Philadelphia market, Ridaroo, with several older sites attempting to garner a national market including erideshare.com and carpoolworld.com.